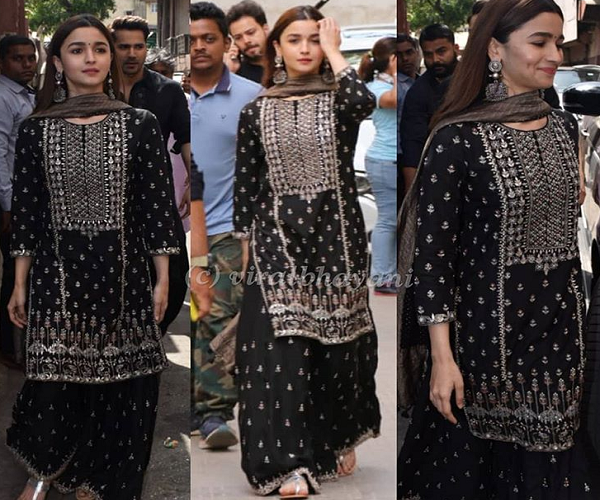 Bollywood top actress Alia Bhatt’s sharara set is for every girl who loves comfort. We know where you can shop for the same outfit – Alia Bhatt is currently busy promoting her upcoming film, a romantic saga named Kalank. Just minutes ago, the star stepped out once more to spread word about her new project in Mumbai with co-star Varun Dhawan. 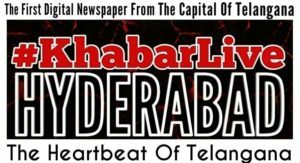 This time, it was to launch the film’s latest song, ‘First Class’. For the outing, Bhatt opted for a black sharara set by Anita Dongre. The actor completed her Indian ethnic look with a pair of chunky silver earrings (a jewellery trend that’s all the rage right now), and a pair of silver Kohlapuris that perfectly complemented the embroidery on her outfit. Alia Bhatt, who will be playing the character of Roop in multi-starrer Kalank, picked a wedding-ready ensemble for the launch of ‘First Class’ that was both, dressy and comfortable. Kurtas seem to be her top pick for Kalank events (remember the white Manish Malhotra kurta she wore for the teaser launch of the movie?) and this time, the star paired her outfit with flats to make sure she was comfortable enough to put on a dance performance for her fans. Though Bhatt’s Anita Dongre outfit was black and white, the intricate embroidery on her kurta and sharara pants elevated her overall look. An outfit like Alia Bhatt’s is just perfect for the bridesmaid who loves to dancing at weddings without having to deal with a fussy sari or heavy lehenga.